WE PROUDLY SUPPORT OUR MUSTANGS Good luck to all student athletes! – Sheriff Michael S. Hall 12C McDonald County Press Thursday, November 29, 2018 W i n t e r S p o r t S p r e v i e W and a lot of that is riding on the shoul- ders of the upperclassmen adopting those younger guys and making them feel wanted and be part of a program that everyone calls their family." Factor said those younger kids will be led by freshman Junior Eliam and Jacob Owen, who Factor said both have a chance at earning starting spots. Factor said the team competition will be tough early in the season with so many wrestlers who do not have much varsity wrestling experience. "We have kids we could put in those weight classes, but we are just so inex- perienced I want those guys to get some junior varsity experience and build up their confidence a little first," Factor said. "Hopefully, that confidence will carry over to varsity matches later in the season. I hope to fill all of the weights by districts with some experienced guys where we will be in the mix to compete for a team award." Factor said, with all the inexperience, the coaching staff has been working a lot on technique while also getting every- one in better shape so they will have all the tools they need to win matches when they take the mat. The Mustang junior varsity began its season on Nov. 17. The varsity does not start until Nov. 27 when the Mustangs host Rogers High School and Rogers Heritage High School. McDonald County will compete in the Neosho, Carl Junction, Springfield, Branson, Liberty and Big 8 Conference tourna- ments prior to the district tournament. 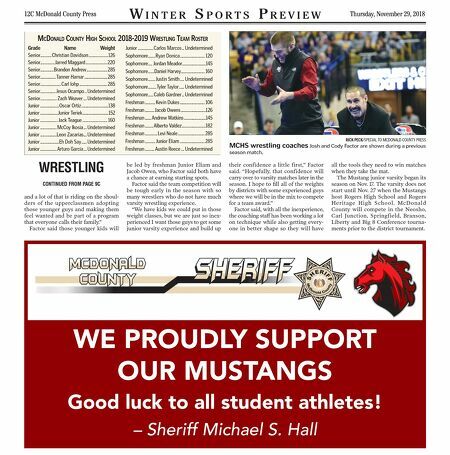 CONTINUED FROM PAGE 9C WRESTLING McDonalD county HigH ScHool 2018-2019 WreStling teaM roSter Grade Name Weight Senior ...........Christian Davidson ...................126 Senior ..............Jarred Maggard .....................220 Senior .............Brandon Andrew .................... 285 Senior ............... Tanner Harnar ...................... 285 Senior .................... Carl Iohp ........................... 285 Senior ...............Jesus Ocampo .. Undetermined Senior ................ Zach Weaver ... Undetermined Junior .................. Oscar Ortiz ..........................138 Junior .................Junior Teriek .........................152 Junior ................. Jack Teague ........................ 160 Junior ................ McCoy Ikosia ... Undetermined Junior ................Leon Zacarias ... Undetermined Junior ..................Eh Doh Say ..... Undetermined Junior ................Arturo Garcia ... Undetermined Junior ............... Carlos Marcos .. Undetermined Sophomore .......Ryan Donica ........................ 120 Sophomore .... Jordan Meador .......................145 Sophomore ......Daniel Harvey ....................... 160 Sophomore ....... Justin Smith .... Undetermined Sophomore ........Tyler Taylor ..... Undetermined Sophomore ..... Caleb Gardner .. Undetermined Freshman .......... Kevin Dukes ........................ 106 Freshman ......... Jacob Owens ........................126 Freshman ...... Andrew Watkins .....................145 Freshman ........Alberto Valdez .......................182 Freshman ............ Levi Neale .......................... 285 Freshman .......... Junior Eliam ........................ 285 Freshman ......... Austin Reece ... Undetermined RICK PECK/SPECIAL TO MCDONALD COUNTY PRESS MCHS wrestling coaches Josh and Cody Factor are shown during a previous season match.